BURNABY, Canada, (Nov. 14, 2016) – The WTF Council met to discuss a packed agenda at the Delta Burnaby Hotel and Convention Center, in Burnaby, Canada, today. It was the council’s first meeting since the Rio 2016 Olympic Games; the previous meeting had been held in Muju, Korea, in May. WTF President Chungwon Choue opened the meeting, with a brief review of Rio 2016. Calling taekwondo one of the “most universal sports” at the Olympics, he noted the increased strength of African taekwondo; the first Olympic medal won by Jordan; and the first female athlete from Iran to win a medal. IOC President Thomas Bach congratulated the WTF on its Olympic success, Choue said; Bach will attend the upcoming World Championships in Muju in June 2016. The WTF’s and Taekwondo Humanitarian Foundation’s ongoing charity efforts to empower refugees and displaced persons are being noted by international organizations, Choue said. He was the only sports leader to be invited to the 2016 China Charity Fair in September; organizers pledged USD200,000 over the next six years to support the THF. Choue was also invited to the Vatican in Rome to attend the first-ever Global Conference on Faith and Sport from Oct. 5-7. A Rio 2016 Result Report and PSS Operation Plan was presented by WTF Sports Director Jay Lee. In Tokyo 2020, the taekwondo competition will take place over Aug. 5-8 at a venue that is 30-40 minutes from the city center. 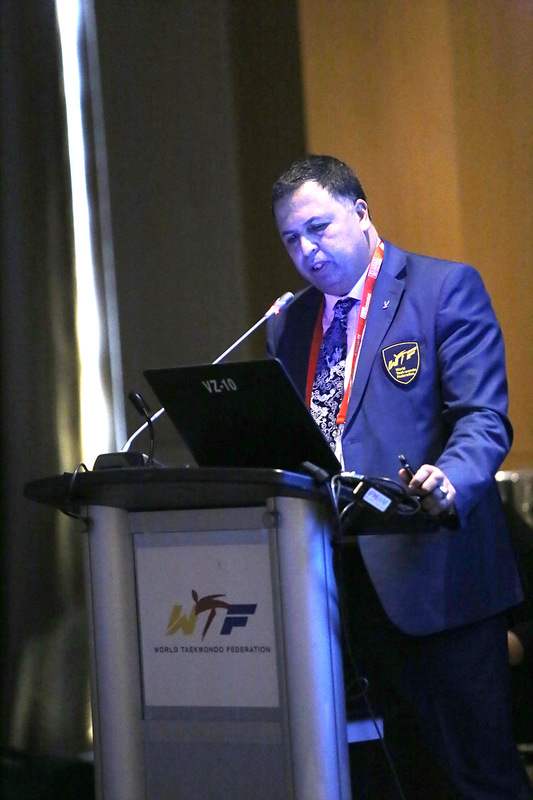 Over the next four years, the WTF will be working on amending competition rules, upgraded presentation, new PSS systems and plans to raise taekwondo’s profile in Japan. Lee showed samples of new-look, Italian-designed uniforms to give fighters a more dynamic appearance. A key agenda item was changed to the game. “Without change, no sport will survive,” Choue said. 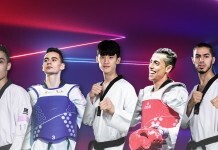 Moves over the next months and years will be taken with the aim of ensuring that taekwondo is not only “fair and transparent” but is also a sport that “excites and dazzles,” he said. He mentioned that the recent, week-long WTF Coach Seminar and Forum in Seoul in October had kick-started this process. WTF Technical and Development Committee Chairman Kook-hyun Jung presented proposed changes to WTF Competition Rules and Interpretations, based on proposals made during a meeting of 30 WTF coaches from around the world in Seoul in October. The amendment passed by the WTF Council today will be voted on by the WTF General Assembly tomorrow on Nov. 15. Amendment proposals to Ranking Bylaws, Poomsae Ranking Bylaws, Standing Procedures for the World Grand Prix series, WTF Event Operations Rules and Regulations and the administration of international kyorugi and poomsae referees were approved. In the afternoon session, the council votes on host cities for major upcoming championships, including the 2019 World Championships. The Canadian city of Burnaby, on the outskirts of Vancouver, will also host the World Taekwondo Junior Championships from Nov. 16-20.